When Tyler Johnson scored three touchdowns in a victory over Miami University of Ohio in September, there was a single word on the front of his University of Minnesota football helmet. It was there because of an unusual agreement between the school, second-year head football coach PJ Fleck and a Chicago-based sports marketing company representing Fleck. The 11-page agreement allowed Fleck’s trademarked “Row the Boat” slogan and other related designs to be placed on the football uniforms of the state’s largest public university as long as Fleck remained employed by the school. It also gave both Fleck and the school legal authority to police each other in the use of logos with the trademark. Fleck does not receive payments through the arrangement but, according to documents reviewed by Public Record Media, a non-profit based in St. Paul, the football coach’s representatives pushed for the agreement as part of his own branding and marketing efforts almost immediately after being hired. The slogan, according to the coach, was born out of personal tragedy. The football coach has said publicly that the slogan – which is largely a motivational tool – had earlier helped him and his family cope with the death of his infant son. Western Michigan University, Fleck’s former school, had featured the same slogan on its own football uniforms. But Western Michigan agreed to a trademark assignment – shortly after Fleck was formally hired in Minnesota – in which the school gave up its ownership of the slogan and in essence allowed Fleck to take his trademarked wording with him. Though football uniforms and helmets at many major college football programs do not feature slogans or symbols associated with a particular coach – let alone a slogan that the coach’s representatives have trademarked with the U.S. Patent and Trademark Office – a University of Minnesota spokesman defended the arrangement. “I don’t have an exact count of how many other collegiate football programs have incorporated elements of team mantras into their uniforms, but it’s not something unique to Minnesota,” Jake Ricker, the director of strategic communications for the school’s athletics department, told PRM in an email. 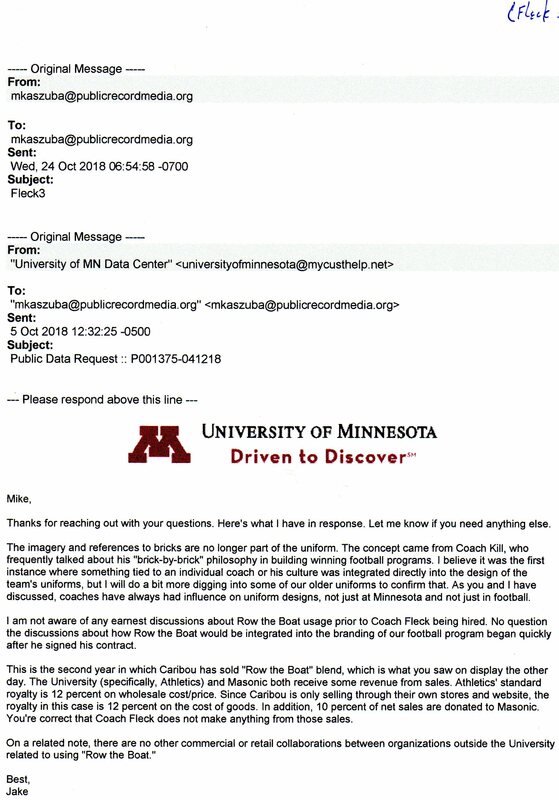 Ricker said that Jerry Kill, a former University of Minnesota football coach, had his own “Brick by Brick” motivational slogan incorporated into the school’s uniforms – and the school removed the “Brick by Brick” wording when Fleck arrived with his “Row the Boat” slogan. Ricker said Kill, unlike Fleck, had not legally licensed his phrase, nor did Kill have a formal use agreement with the school. Since Fleck’s hiring early last year, the coach’s “Row the Boat” mantra has at times become synonymous with the school’s own branding. The slogan, for instance, appears on bags of “Gopher Blend” coffee at Caribou Coffee stores in Minnesota. A school spokesman said that, while Fleck does not receive any money from the arrangement with Caribou, the university’s athletic department receives a 12 percent royalty on the cost of goods, and that the University of Minnesota’s Masonic Children’s Hospital in addition gets 10 percent of net sales. The coach’s Twitter account also had an entry the same month showing the “Row the Boat” logo and pictures of singer Jay-Z and Beyonce. “Excited to be taking the team to the @Beyonce & Jay-Z concert tonight,” the Twitter post stated. Additionally, in September, the coach’s Twitter account had a short video that featured a pinball machine with the “Row the Boat” slogan and graphic. It showed highlights of a punt return for a touchdown by the school’s Antoine Winfield Jr. against New Mexico State University in late August. 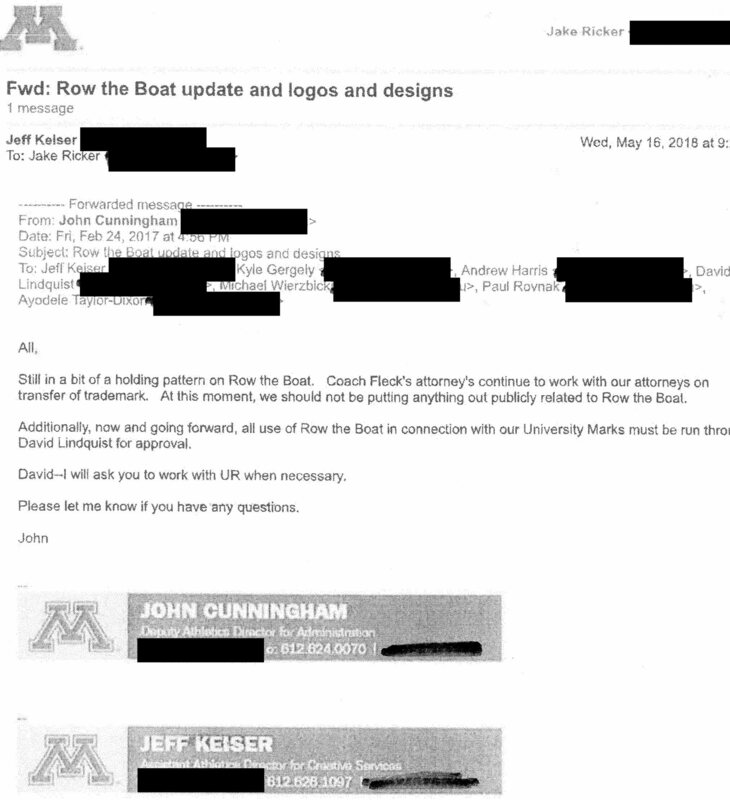 According to the agreement with the school, Fleck is allowed to “register ‘rowtheboat’ on one or more of the .com, .net, and .org domains for personal use.” The agreement allows Fleck to use the “Row the Boat” slogan separately from the university, as long as none of the school’s own trademarks are used and the coach notifies the school. When Minnesota unveiled its new football uniforms earlier this year, an internal school email heralded the event as “Row the Boat meets Ski-U-Mah” – and said the intent was to embrace “the past to create the future” by blending Fleck’s licensed slogan with the school’s own iconic “Ski-U-Mah” pep chant. 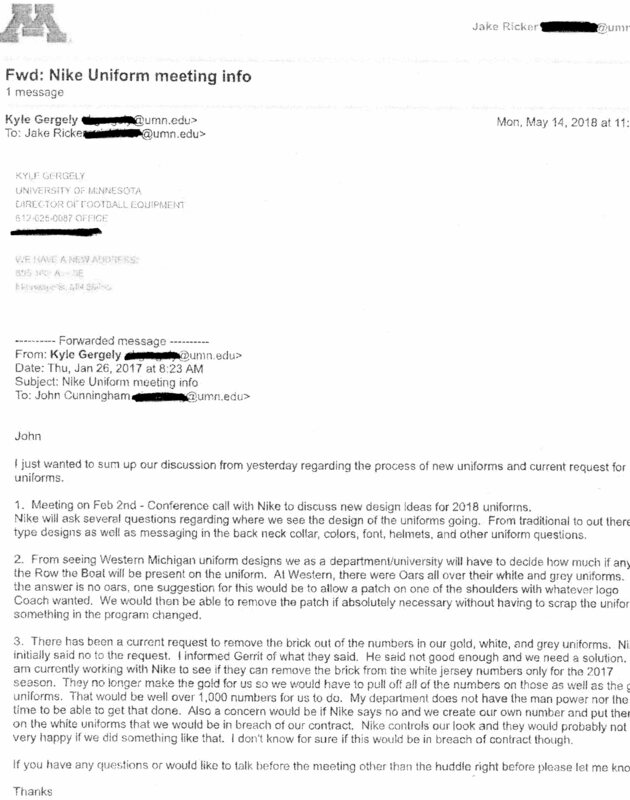 In a Feb. 19 email Paul Rovnak, the school’s assistant communications director for athletics, shared a draft press released that said of the new uniforms, “A unique pattern of an oar, boat and compass are emblazoned on the jersey collar and numbers to represent the program’s Row The Boat culture.” The uniforms, the email stated, had more than 100 combinations, and had three different colored jerseys, three different colored pants and three different colored helmets. A university spokesman told PRM that adding the “Row the Boat” elements to the school’s football uniforms should not mean extra costs for the school. Fleck’s contract with the 167-year-old public university meanwhile contains several noteworthy provisions. The agreement allows Fleck to use the school’s “Block M” and “Ski U Mah” slogan and patterns, as well as the school’s maroon and gold colors in the “Row the Boat” design, as long as those applications are tied to his coaching duties. Though Fleck cannot sublicense others to use the design, the school gave the coach “a non-exclusive, worldwide, royalty-free license” as part of the contract. In addition, the agreement gives the football coach leverage over the school – and vice versa. If Fleck’s representatives identify “any deficiencies in compliance with the quality standards of the licensed goods”, the school shall agree to a plan to make fixes. The school is also, according to the agreement, subject to an “audit or inspection” should Fleck’s representatives want evidence the school is upholding its contractual obligations. 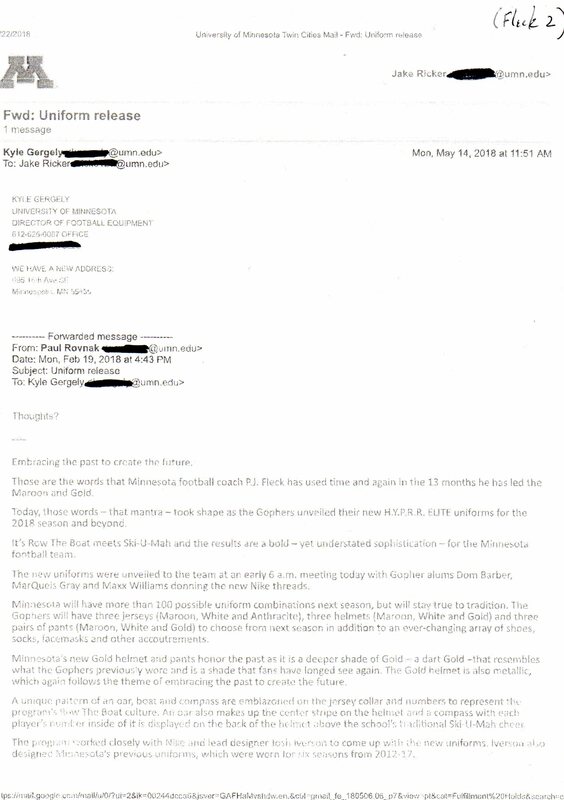 The documents obtained by PRM show that the push to have Fleck’s new school incorporate the slogan began quickly after his hiring was announced in early January 2017 – and before the school’s board of regents formally approved his hiring in mid-February 2017. 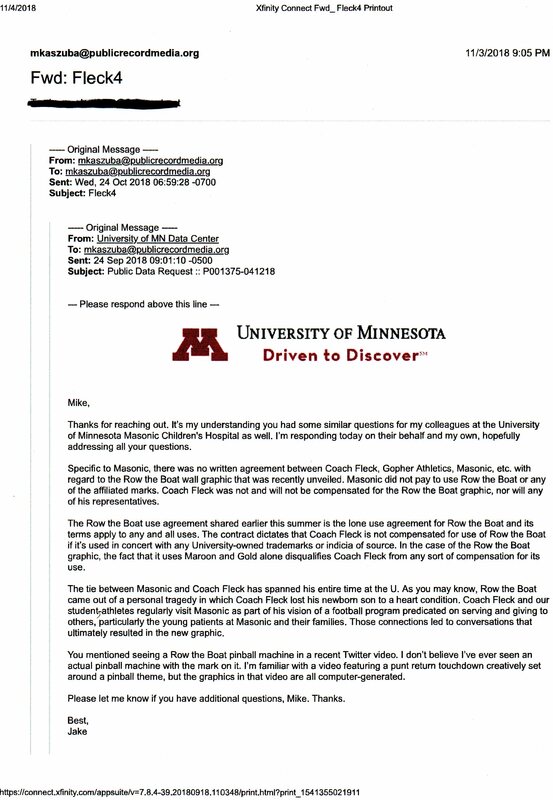 “We as a department/university will have to decide how much if any of the Row the Boat will be present on the uniform,” Kyle Gergely, the university’s director of football equipment, wrote in a Jan. 26, 2017 email. “At Western, there were Oars all over the white and grey uniforms,” Gergely added. The documents also show the complications that can occur once the school agrees to let a coach put words and symbols on its uniforms. At the time Fleck was being hired, the school pushed Nike – the apparel company that furnishes the school’s football uniforms – to remove a symbol that had been associated with Kill, the former football coach who resigned due to health concerns. The symbol — a brick – had been part of Kill’s widely-publicized “Brick by Brick” motivational campaign. (A school spokesman added that Fleck “was part of the call with Nike and our administration” to redesign the football uniforms). “There has been a current request to remove the brick out of the numbers in our gold, white and grey uniforms. Nike initially said no to the request,” Gergely said in a January 2017 email. “I am currently working with Nike to see if they can remove the brick from the white jersey numbers only for the 2017 season. “[We] would have to pull off all the numbers on [the gold uniforms] as well as the grey uniforms. That would be well over 1,000 numbers for us to do. My department does not have the man power nor the time to be able to get that done,” he wrote. At the time of his hiring, Fleck’s decision to come to Minnesota was seen as a major hiring coup for the school. Just two months before Fleck left for Minnesota, ESPN’s “College Game Day” – a pre-game television show spotlighting that week’s major games – did its broadcast from Western Michigan as that school’s football program enjoyed a run of success on the field. The Washington Post described Western Michigan’s football program as “almost completely anonymous” before Fleck came along. Fleck’s departure from Western Michigan University was likewise complicated because of the coach’s desire to take the Row the Boat slogan with him. In March 2017, Western Michigan signed a trademark assignment agreement that formally gave the school’s ownership of the Row the Boat slogan to Harlan Sports Management, a Chicago company representing Fleck. Western Michigan, according to the agreement, began using the licensed slogan in December 2012 when Fleck was hired as its football coach. Another agreement between the coach and Western Michigan – signed by Fleck four days after he was formally hired in Minnesota — called for Fleck to establish a $10,000-a-year scholarship at the school that would begin in August 2017 and go for a minimum of five years. The agreement came less than a year after Fleck had earlier made a separate – but similar — $10,000-a-year pledge to the school that would run through December 2020. © 2017 Public Record Media. All Rights Reserved.